This design, along with the production of two mirror-image door panels, was constructed in late 2009. I had worked before with these clients, albeit just in terms of removing, repairing and refitting a damaged door panel in their previous home. They had recently moved to a new home in Blackheath in South East London, close to Greenwich, for which they had almost completed an extensive remodel. The requirement for the glass for the main entrance door was a traditional pattern, in keeping with the exterior of the building, that included some of the client's preferred colors. We often fit panels such as this behind an outer pane of laminated safety glass, for security and protection; however, since this tends to degrade the external appearance somewhat, the client decided against it. The panels were fitted with four square section steel saddle bars per panel, with associated retaining wires. I used English Muffle glass for the main colored pieces, because of the range of pastel colors available, and for this sort of work I like the sparkle of that texture. Waterglass was used for the central motif. The narrow red inner border is Imera and the uncolored outer border helps to project the design. Consideration was given to using painted and stained center circles, but this was rejected because we were not seeking a truly "old fashioned" look. Likewise, we considered alternatives to the blocks of roundels, but felt that these provided added interest, as did the small, contrasting squares at the border corners. When I started out making leaded panels, I was drawing patterns by hand — wishing I'd paid more attention to geometry in math class! I had some familiarity with simple drawing software, and researched alternative computer packages for producing illustrations for clients, as well as working drawings. Then I found Glass Eye 2000! All of my work is produced using it — in fact I have two fully-licensed copies running on various computers, as well as using the "Park" feature for the license. The ability to produce visual impression drawings for clients and then to go pretty much straight to the working drawing is invaluable. I have built up a collection of motif and design elements that can be used as needed, and I find the drawing tools more than adequate for originating new designs as well as reproducing old ones. Colin was cutting window glass as a boy, but only started making leaded panels in 2002 after attending a short course at a local workshop. He exhibited a couple of panels at an "Art in the Park" event, and was encouraged by making his first sale there. 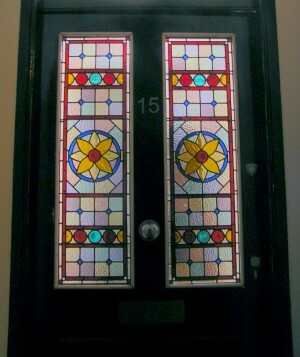 He started South London Stained Glass in 2005, which although small has grown year by year. The company operates mainly in South East London, and much of their work is in repair, rebuilding and replication of Victorian and Edwardian stained and leaded glass in homes. You may contact Colin by email or visit his website.